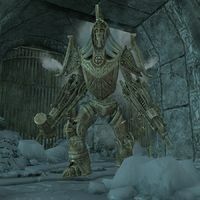 Frosted Dwarven Centurions are Dwarven Centurion that use frost attacks rather than steam. Two of them can be found in the Winter's Chimes section of Runoff Caverns, although only one is functional and will attack when you approach. They are located in a hidden area, guarding the Dwarven Winter Visage. This location can be difficult to find; see the quest page for more information. This page was last modified on 18 March 2019, at 23:49.